“A new study has shown for the first time how limonoids, natural compounds present in lemons and other citrus fruit, impede both ER+ and ER- breast cancer cell growth. This sheds new light on the importance of citrus fruit for breast cancer prevention and supports past studies which showed fruit consumption may lower breast cancer risk. Simple, take an organic lemon, wash it, and then put it in the freezer. Once it is frozen you get whatever is necessary to grate or shred the whole lemon without even peeling it first. Or you can make lemon cubes just like in the picture! 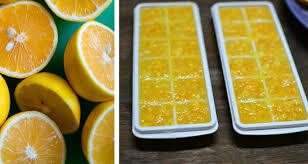 To do this, simply blend the lemon peel and all and pour it into an ice cube tray. This has not been revealed because there are people out there that want to make a synthetic, toxic version that will bring them huge profits – Shades of Monsanto.